As the Internet takes over more and more of our daily lives, and more of our data heads to the cloud, then bigger data centers are a necessity to handle all of that information and web space. Gone are the days of text-only pages. Today we have busy interactive pages with businesses demanding guaranteed 24 hour uptime. 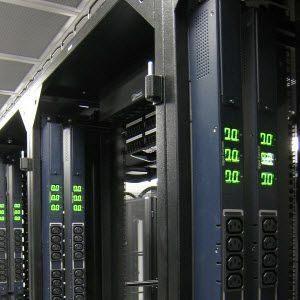 In order to guarantee that uptime, web hosting companies have had to invest lots more money in their data centers. Our infographic today comes courtesy of Wikibon.org. It gives a good rundown of the 5 biggest data centers in the United States, the biggest being the Lakeside Technology Center in Chicago, which needs 50 diesel generators to power it and is the second largest power customer after O’Hare Airport. Microsoft has its own one which powers Bing, XBox Live and Hotmail, while the third largest in Atlanta hosts Twitter. But what I find surprising is the total absence of Google from this infographic. Where are their data centers? Don’t they rank in the top 5? Any ideas? If so, let us know in the comments below. Explore more about: Infographic, Microsoft, Twitter. Actually, Google defies the known laws of physics. Those 8 centers are collectively known as the Googleplex for the sheer quantity of data housed inside them. The number in written notation is actually bigger than the universe. Hire the best and follow the bread-crumbs. They take more than one person to manage, so there's a handful of people who know. It's just unlikely that will be leaked anytime soon, legitimately. Google don't let people know how many servers etc they have.